Tamara “Tammy” Lynn Cartwright, 55, of Lebanon, died Saturday, September 29, 2018. Tammy was born May 11, 1963 in Lebanon the daughter of Lloyd and Martina (Vandehey) Ogbin. She had resided in Lebanon all her life, where she spent her life caring for others. Including her career in the health care field, where she cared for many during their final days. Tammy was a member of New Hope Church in Lebanon. She enjoyed crafts, drawing, sharing the word of God with anyone willing to listen and helping those around her. Tammy married Alvin B. Cartwright, Jr. on March 20, 2001. He preceded her in death on December 28, 2017. She was also preceded in death by her mother Martina Ogbin, brother Randy Ogbin and step daughter Betsy Jean Bliss. Tammy is survived by her father: Lloyd Ogbin; step-children: Lori Ann Cartwright, William Cunningham, and Larry Cartwright, brothers: Richard Ogbin, nieces: Amy Ogbin and Rebecca Ogbin, great nieces and nephews: Kevin Corrington, Cassie Corrington and Mya Jones. Services will be held at 11:00 AM, Friday, October 12, 2018 at New Hope Church in Lebanon. Burial will follow at the Lebanon IOOF Cemetery. Huston-Jost Funeral Home is handling arrangements. 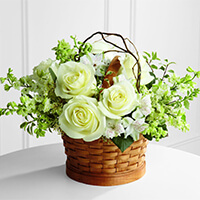 To send flowers to the family of Tamara Lynn "Tammy" Cartwrigth, please visit our Heartfelt Sympathies Store. 1/4 mile north of Samaritan Lebanon Community Hosp on Hwy 20. From Hwy 20 Turn on to Cemetery Road at Pacific Price Gas Station. Follow road into Cemetery. Cemetery has no street address. We encourage you to share any memorable photos or stories about Tamara. All tributes placed on and purchased through this memorial website will remain on in perpetuity for future generations. Ogbin Family: All my love is with you.